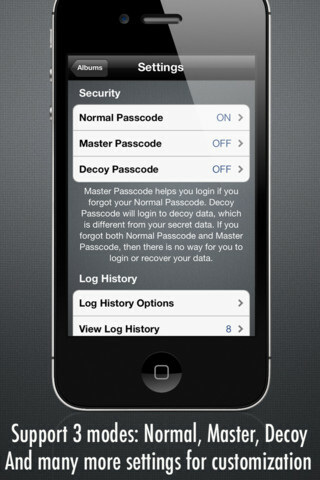 Disclaimer: This app does not provide true iPhone/iPod/iPad lock screen functionality. The dot lock screen is only applied for photos, videos and notes stored within this app only. Now you can protect all your secret and valuable photos, videos and notes, organize, browse and play slideshow within this app easily and securely. Never fear your friends, children, parents, wife or husband viewing your secret photos/videos/notes anymore. Stay tuned, next updates will support Contact, Bookmark, Password, and you will have free update without additional charge. Please enable Location Service for importing multiple photos/videos and capturing location of intruders.